There are two semesters during the school year (September through January and February through June). Each semester is 20 weeks. We offer five different classes; Tiny Tots (parent and child), Preschool (ages 3-5), Recreational, Free Running, and Junior/Senior High School. See detailed descriptions under the class menu above. Preschool OPEN GYM is marked in bold (Thursdays 11:30 - 12:30). The cost is $10/child. There is NO OPEN GYM in the summer. 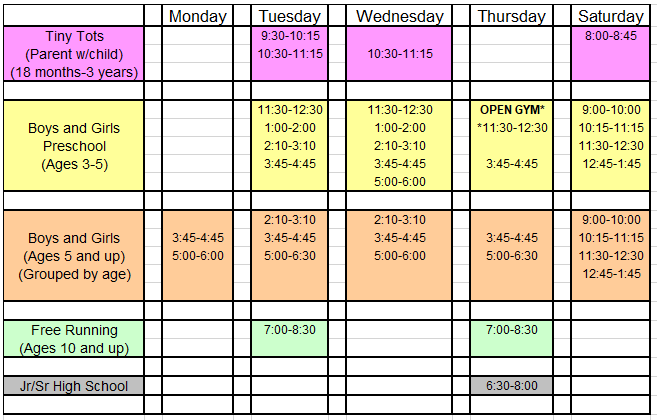 On our schedule you will see that we have after school and Saturday morning classes for boys and girls ages 5 and up. For example, on Tuesdays at 3:45pm we could have one group of boys, and three groups of girls (5-6 yrs old, 7-8 yrs old and 9-11 yrs old). Then at 5:00pm, we might have the same age ranges for girls (3 classes), and another boys class (ages 8-10). What if the class we sign up for is too easy (or too hard) for my child? Our instructors are used to having a range of abilities in each class; so many of the lesson plan stations will have an easy option or a ‘super challenge’. This way, each child can progress at their own pace. In the event that the instructor or student feels that the class is not a good fit, it is always possible to switch into another class.